So, our congress critters have returned to DC. The conventions are over, the election is still seven weeks away, a budget has still to be passed. 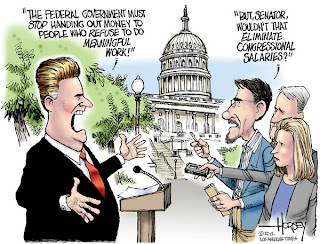 So, maybe the 112th Congress will actually do some work? Not likely, as David Horsey points out. The list of accomplishments for this Congress is short and risible. The lawmakers earned an easy feather in their cap by shaving 2 percentage points off the payroll tax for the last two years. However, with deficits mounting higher by the second, the expectation is the tax holiday will not be extended past Dec. 31. The 112th Congress has passed far fewer bills than any Congress in recent years. 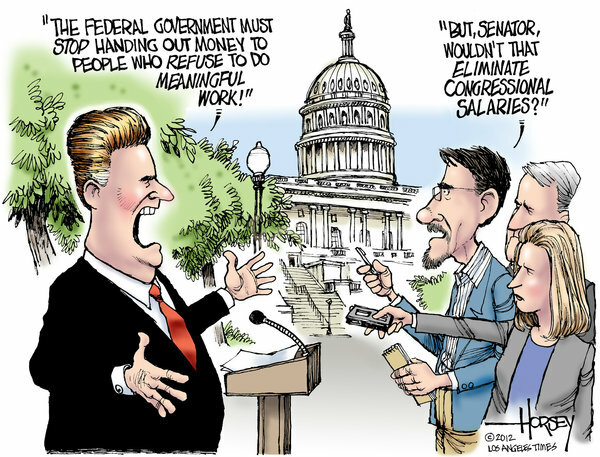 Our current crop of lawmakers may, in fact, have achieved the lowest productivity of any Congress in modern history. One would have to go back to the pre-Civil War period to find a batch of national legislators as deeply divided and rigid in their positions. Compromise is now a dirty word and, as the debt ceiling fight proved, there is a large faction among the House Republicans who would close the government and bring down the economy rather than vote for the tiniest of tax increases. And so this sorry crowd has slinked back to Washington for a few days to see if they can do the absolute minimum – pass a continuing resolution that will allow the federal government to pay its obligations for a few more months. Then, they will all head back home to continue campaigning for re-election. C'mon, David. Don't be so naive. These folks get six-figure salaries, a health care plan for themselves and their families most of us can only dream about, and a real, live pension plan. They have staffs which do most of the hard work for them, and they don't have to pay the salaries or benefits. They work four days a week at most, and they get vacations that double those given to the public school teachers that they love to demonize. They are also pretty much guaranteed cushy jobs after their government "service" with the lobbyists and corporations they've served so well. What's not to like? Of course they want these jobs. And we keep electing and re-electing these slugs. Maybe it's time for a change, you think?